I loved Six of Crows and Crooked Kingdom and I knew I had to go back to the beginning of the Grisha world. 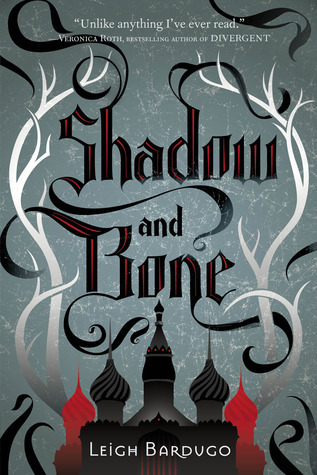 Shadow and Bone is the first in the series. The main character is Alina Starkov. She's an orphan who has grown up in a house considered as an orphanage with her best friend Malyen Oretsey. They have gone through everything together. But, Alina has a secret. She's in love with Mal while he, on the other hand, has no idea she likes him and is still bedding pretty little things. As adults, Alina and Mal join the Ravka army together. She's a map maker and Mal's an amazing tracker. When it's time to cross the Shadow Fold, a dark area where horrible animals called Volcra feed, Alina and Mal are attacked by these beasts. This causes Alina to release her power. Unknown to her, Alina is considered a sun summoner. Of course, this turns her life upside down. In the blink of an eye, she's taken away from Mal and into the Little Palace where the Darkling, the most powerful Grisha, rules despite a King and Queen living on the premises. But Alina can't forget Mal. She didn't ask for any of this. She's also afraid they have made a mistake and she's not a Grisha after all. I thought the world-building was done perfectly. However, I found myself thinking it was too slow at times. I wanted more action. Alina was a good heroine. She starts as weak and unimpressive and thanks to her trainers, she becomes powerful by the end. Mal made me furious. The first time he sees her again at the Palace, he behaves like a self-righteous pig. Luckily, this didn't last long and my opinion of him improved exponentially over the course of the story. I was kind of disappointed in the Darkling. I mean the guy is pure villain but wouldn't it be great if he really weren't? I'm huge on liking antiheroes. I'm going to go ahead and read the next two books but in my opinion, Mrs. Bardugo's writing has improved so much more since she wrote this book.